Lort Smith is the busiest not-for-profit animal hospital in Australia. 67 vets and 94 vet nurses provided high-quality veterinary care for 24,384 animals in 2015. Every year at Lort Smith Adoption Centre 1,000 animals are rehouse, 95 animals are boarded in crisis and 1,200 animals are fostered. This May, 10% of proceeds from our Wildflower Posy Box will go towards the amazing care provided by Lort Smith. 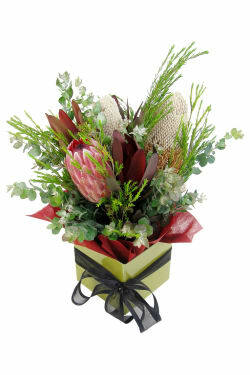 Send out a box of beautiful and hardy Australia native flowers and contribute to the work carried out at Lort Smith. Lort Smith was built on its current site in North Melbourne in 1936 by the Animal Welfare League of Victoria. The founder Louisa Lort Smith was passionately committed to caring for the animals of poor and disadvantaged people. Nearly 80 years later, this is still the heart and soul of Lort Smith Animal Hospital.